It is difficult not to notice the movement involved in saving our bees, and there are some very good reasons to take the preservation of bees seriously. The most important reason is that nearly all of the food we eat relies on them as pollinators. So, even if you don’t want bees around your home or business, it is better to have them moved than exterminate them. That’s where we come in. 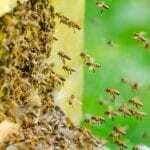 Here at Florida Bee Removal we offer reliable bee relocation services in the Palm Beach, Florida area that make you happy and preserve humanity’s food source.